In a bid to support Government departments unlock the hidden potential of data generated as a part of the governance processes, the premier science and technology organisation of the Government of India, National Informatics Centre (NIC) in association with the National Informatics Centre Services Incorporated (NICSI) have jointly set up the Centre of Excellence for Data Analytics (CEDA). The Centre of Excellence for data analytics aims to improve the overall governance with insights generated from the data analysis. Hon’ble Union Minister of Electronics & Information Technology, Sh. 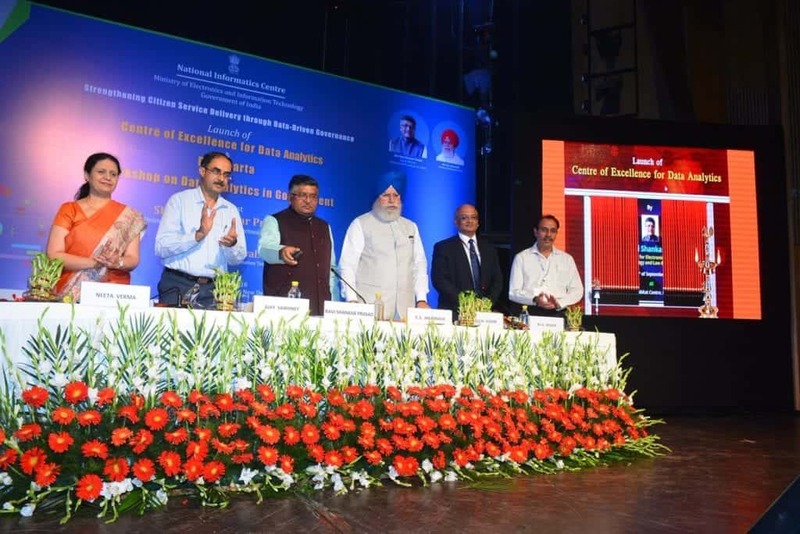 Ravi Shankar Prasad in the presence of Hon’ble Minister of State, Electronics & Information Technology launched the Centre of Excellence for Data Analytics (CEDA) on 28th September 2018. The launch is a part of the Workshop on Data Analytics in Government and was attended by several dignitaries representing the Central Government. Centre of Excellence for Data Analytics (CEDA) is set up with the sole vision of kick-starting and fast-tracking advanced analytics and machine learning capability adoption keeping the Centre as the locus of expertise and excellence in Data Analytics domain. The centre shall provide quality data analytic services to different government functionaries and departments by deploying people with the right expertise and identify appropriate tools. In the future times to come, the centre will focus to provide data analytics services to the government and assist to solve complex policy issues through data-driven decision-making technologies. The ultimate goal of CEDA will be to ensure effective policy formulation and implementation of various development initiatives to benefit the citizens of the country. • Understand their business requirements and define their analytics requirements. • Identify the datasets which will be required to meet their analytic needs. • Determine the access to all relevant data sources taken from within as well as outside the government sources. • Build the required data analytics solutions suited to different departments. • Integrate departmental data silos and deliver an integrated analytics platform to ensure best analytics solutions for an integrated policy formulation. NIC is a premier technology advisor and ICT solution provider to the Government of India at all levels. The advisor has by far taken the first step to introduce latest technologies and services in government including the introduction of ICT, the establishment of NICNET or National Knowledge Network (NKN) and the development of critical e-Governance solutions. In addition, NIC has played a pivotal role in facilitating other services and support as required by the Government. NICSI is a trusted partner of NIC being actively involved in supporting all NIC’s initiatives through resource provisioning with extending the facilities of ICT infrastructure such as Development Center, National Data Center at Shastri Park, Cloud infrastructure etc. Recognizing the emerging digital ecosystem, NIC backed CEDA is poised to kick-start and fast-track the deployment of advanced analytics and machine learning capabilities to ensure Government data is managed with intelligent insights. Did You Know Gmail Has an Analytics Tool?